It's a good thing that I did so, because the 1000-seat room did completely fill up. 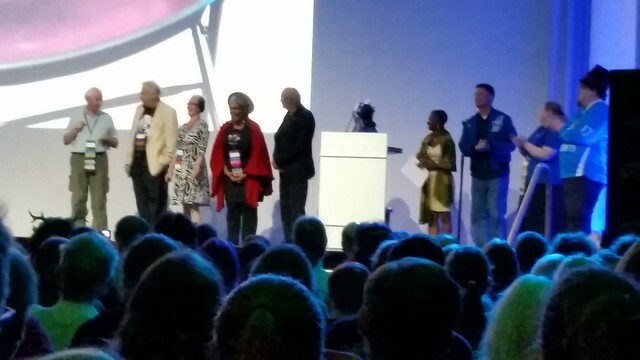 The guests of honor of Worldcon 75 made their final appearances on stage. 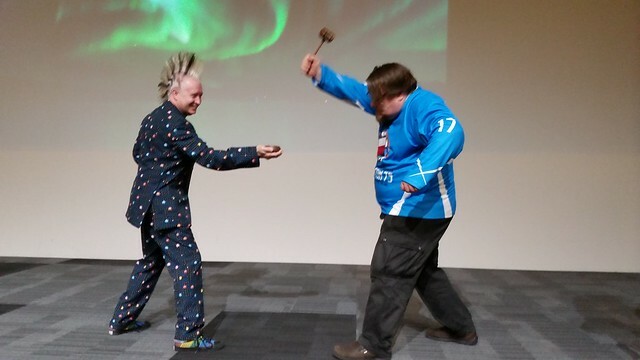 Worldcon 75 Chair Jukka Halme brings down the Gavel of WSFS on the 2017 Worldcon, while Worldcon 76 Chair Kevin Roche assists by holding the sounding block. 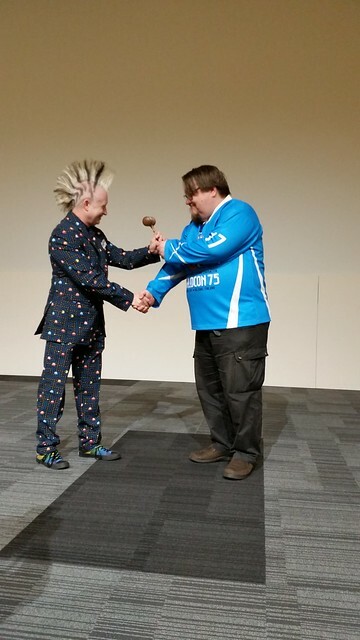 Having officially closed Worldcon 75, Jukka hands over the Gavel of WSFS to Kevin Roche, who then introduced a video about San Jose and called on all of the members of the Worldcon 75 team who were present in the room (and that included me) to stand up, which we did. Since we were all dressed alike, and since San Jose's best-known sports team are the Sharks, we all then started snapping our fingers in unison. Some people got the joke. 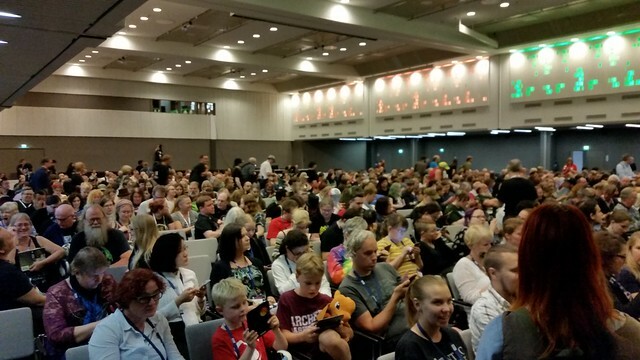 And so officially ended Worldcon 75. There was still a bit more to do. But first, Lisa and I needed to get dinner, which led to a separate unwanted adventure. Lisa and I first checked and confirmed that the convention centre was closed except for tear-down, and thus all of the food service venues were closed. We took the elevator that leads to the skywalk across Pasila St. in front of the hotel and looked for what we though were some open restaurants, but there was nothing there, so we went back across the skywalk and took the elevator down. One meter before the elevator reached street level, it stopped. And it would go no further. Pressing the up button did no good. After a bit, we tried pressing and holding the alarm button as directed. After a bit more, a bit of static came out of the speaker on the elevator. In case they could hear us, I tried to explain the problem. One person standing outside the elevator told me to call the support telephone number in the elevator, which I did. (Good thing I had a phone that would work in Finland!) The operator understood me and I was able to give them the elevator number. They said that they would send someone. By then, other people were gathering around, including Michael Lee and Kate Secor, my management in the WSFS division. They went off to look for help. Around this time, the elevator lurched suddenly and dropped maybe half a meter, which was actually rather worrying. It was also getting a bit stuffy as well. We were continuing to wonder what to do when someone (I'm still not sure who) walked upstairs and pushed the call button. The elevator came up and opened. We got out, he got in, pressed the down button, and got back out again. The elevator descended normally and opened correctly at the bottom. I guess that reset it, but we decided that we weren't going to try using it again. Lisa has been having a great deal of difficulty with stairs, but she made her way down them here. After our "ordeal" on the elevator, and after determining that the hotel restaurant had a one-hour wait, we decided to simply get on the train and go downtown, where we ate at the same Italian restaurant across from the train station at which we've eaten earlier. Robin Johnson was dining there and recommended the moosemeat with gnocci, which Lisa had. (She called it "interesting.") I had salmon over pasta with pesto sauce, which I enjoyed. After a good meal, we went back up to Pasila, where we had one more party to attend, and unlike most of the social functions at this convention that were something of a chore, this one would be a pleasure.